I am so, so excited to finally share this with you. Last year, Jolene Haley and I wrote Harrowed, a love letter to '80s slasher movies. In Harrowed, a killer known as the Woodsview Harvester terrorized a group of high school seniors, and only two of them made it out alive--Avery Blair and Quinn Grady. Well, it's been one year since the massacre, and the harvest season is upon us again. 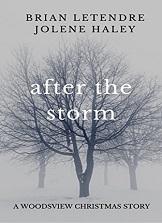 Avery and her best friend are trying to move on and leave their horrible past behind. They’ve enrolled in college, and taken on new challenges. Avery has a campus radio show, and Quinn has found a release—and a new relationship—on the roller derby track. Avery Blair is haunted by the ghosts of her past—memories of the slayings that torment her days and curse her sleepless nights. She can dismiss the visions of Jason she sees everywhere, but she can’t ignore the signs that scream the Harvester is back…for blood. 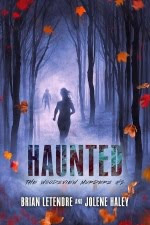 Add Haunted on Goodreads Now!!! Just in time for the Halloween season, my new short story collection Intrusive Thoughts (Volume One) is available digitally on both Amazon and Drive Thru Fiction for $2.99! If you're looking for a physical copy, the print version of the book will be available shortly on Drive Thru (I had to update a couple things from the first print run). And don't forget to add Intrusive Thoughts to your Goodreads shelves now! Intrusive Thoughts (Volume One)--Coming 9/27! It's almost here! My short story collection Intrusive Thoughts (Volume One) will be arriving September 27th in both digital and print. 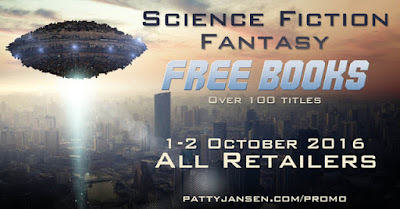 You'll be able to pick up the digital version on Amazon for Kindle, or in print and multiple digital formats (ePub, PDF, Mobi) over at Drive Thru Fiction. 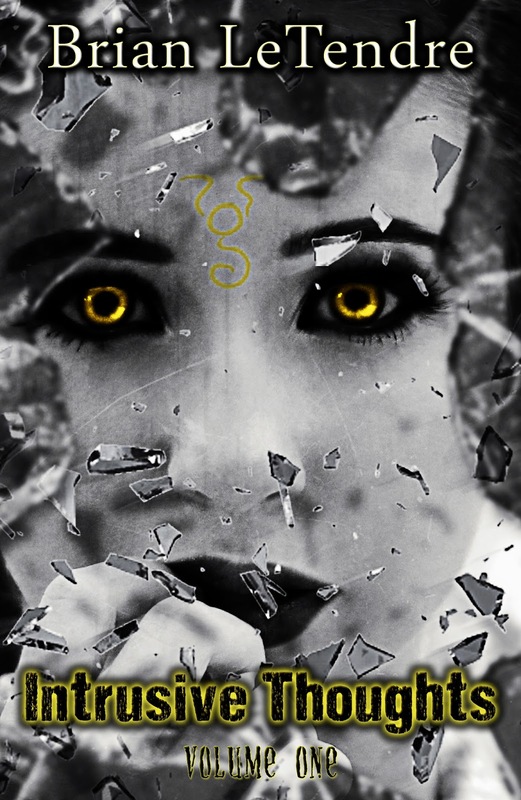 You can add Intrusive Thoughts (Volume One) on Goodreads now! 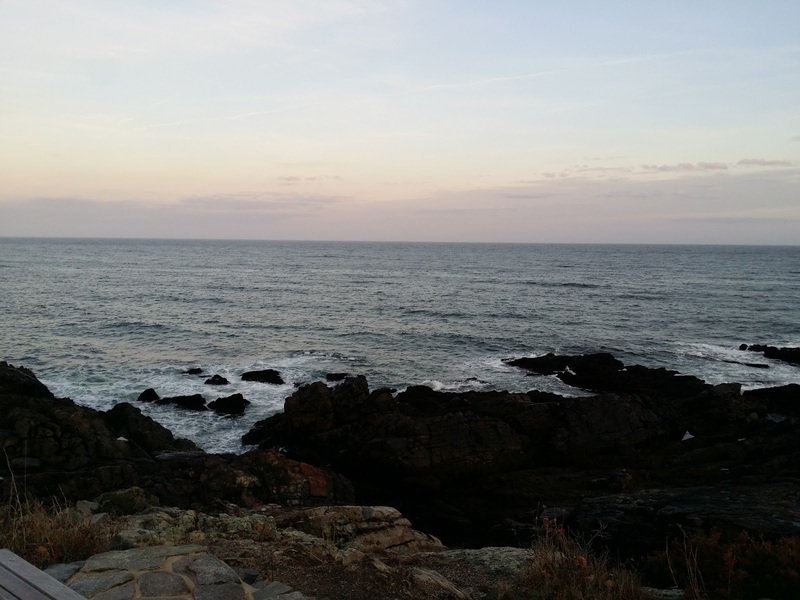 HAUNTED Update: The Draft is Done! This week Jolene and I finished the draft of Haunted, the second book in the Woodsview Murders series, and the sequel to last year's Harrowed. We are rolling right into edits, but I figured I'd celebrate by just giving you a hint of what you can expect from the book, as it's a much darker story than the first book. 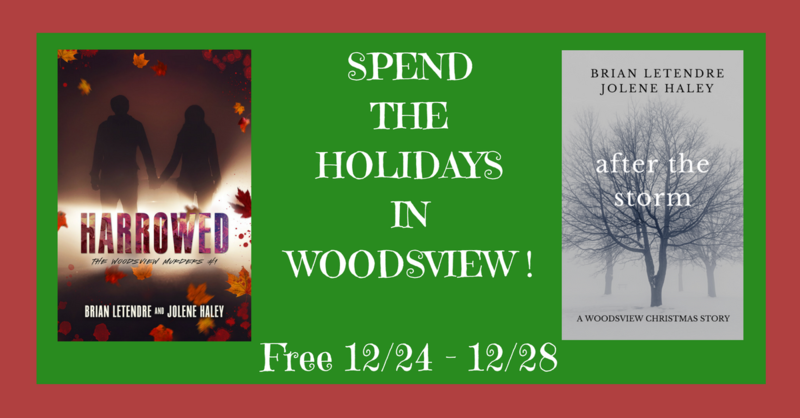 We're picking up one year after the Woodsview murders, and both Avery and Quinn have been profoundly affected by the killing spree that took so many people that were close to them. Avery in particular is struggling to move on after losing the love of her life, and it's affecting her relationship with Quinn. She's in a very dark place as we open the book. Woodsview itself is a different place now. October used to be a special time of year in town, but the Harvest festival is no more, and the remaining residents of Woodsview would just assume skip the entire season altogether, for it only brings memories of the horror they suffered at the hands of the Harvester. 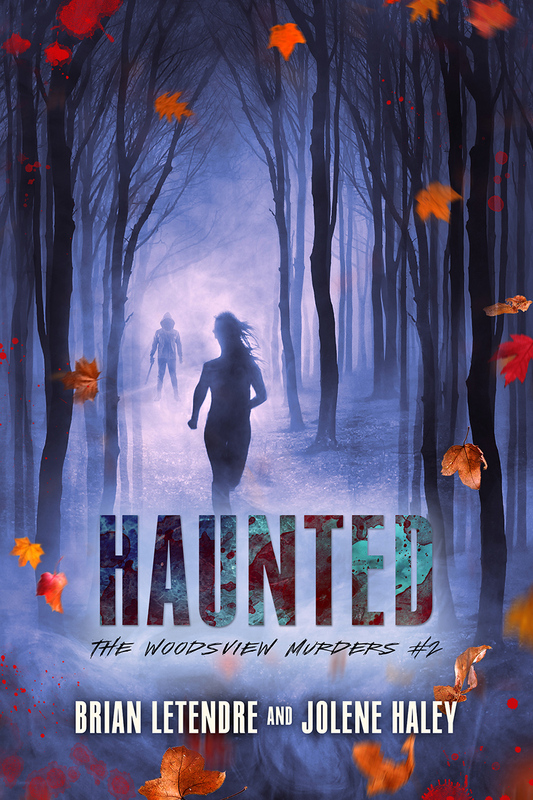 The Harvester is a boogeyman that most residents of Woodsview only mention in hushed conversations nowadays. 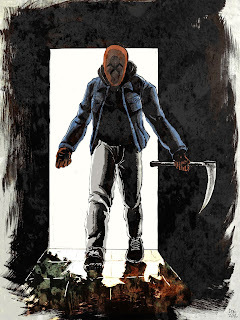 But the anniversary of the Woodsview murders is approaching, and with it will begin a new chapter in the legacy of the Harvester. Okay--there's a lot more I could share, but Jolene will kill me. So, I'm going to jump into edits. and I'll check in along the way. Haunted will be out before Halloween, so stay tuned for a cover reveal and more specific release info soon! Have you ever had to postpone a trip at the last minute? You had already bought the plane tickets, planned your itinerary and took the time off from work, but for whatever reason, something came up, and plans needed to change? Well folks, I'm sad to say that Jolene and I have had to postpone our trip to Orchard Pointe. You might have figured that out already, as we were shooting for an August 16th release date and that came and went. The only reason we didn't make an announcement at that time is that we were hoping to have the book ready to go before the end of August. See, Orchard Pointe was supposed to be our summer book. 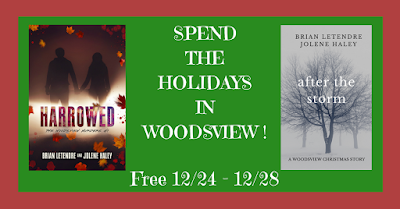 We have the Woodsview Murders series as our Fall/Halloween series, and Orchard Pointe was going to be our spring/summer series, as it's less Friday the 13th meets Scream, and more Something Wicked This Way Comes meets Lost Boys. And the book is very close. Like, really close. Like, we could put it out now and it would probably be fine close. But it's not exactly where we want it yet. The last coat of polish isn't dry. 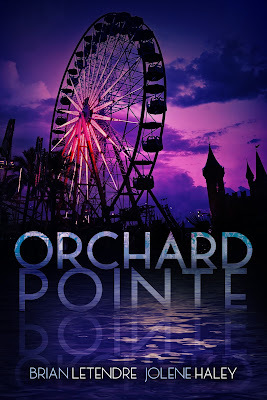 And so, rather than rush the book out and have it crowd the upcoming release of Haunted, we've decided to push Orchard Pointe into next year. This will give Haunted the spotlight it deserves this Fall, and give Orchard Pointe plenty of room to breathe. We still want the Orchard Pointe series to be our spring/summer series, and this delay will allow that to happen. This is the right thing to do for our book, even though it hurts a little. One of the things that dulls the pain a bit is that between now and the release of the Orchard Pointe novel, readers will get at least two and possibly three Orchard Pointe stories that will begin to introduce that world and its characters. The first will come when my new short story collection Intrusive Thoughts (Volume One) is released digitally later this month. The second story will be in the Pizza My Heart anthology (or Pizzathology, as it were) that releases in November, and we should have another short story out very early next year. We're sorry we couldn't bring you the debut of Orchard Pointe this summer, and that you'll have to wait a while longer. But a lot of love when into creating the world and characters of Orchard Pointe, and we want to make sure that shows in the story you will be reading. We appreciate your patience, and we will keep you posted on all things Orchard Pointe as we move forward. 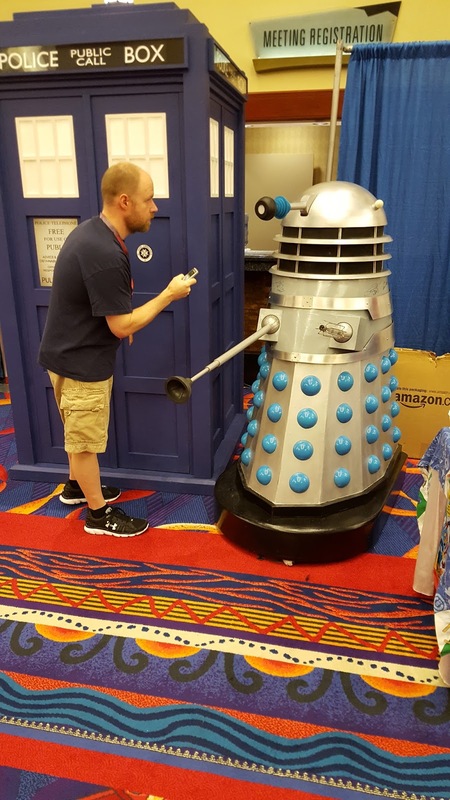 I traveled down to the Matrix Conference Center in Danbury, Connecticut on Saturday for the third annual CT HorrorFest. Rob and Christine Caprilozzi and all of the crew over at the Horror News Network put together another fantastic show. 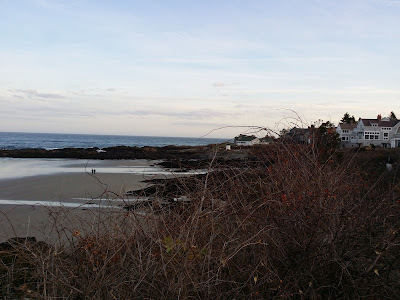 I saw some old friends, made some new ones, and had my best day of book sales ever. I should have known the day was going to be great, when it began with meeting some of the stars of one of my all-time favorite franchises. I had just finished setting up my table when I saw Ellen Sandweiss and Theresa Tilly--Cheryl and Shelly from Evil Dead. They were looking for their table and I was more than happy to get them to where they were supposed to be. We got to chat for a couple minutes and they are both super nice. And, when I found their table and dropped them off, I got to meet Zach Galligan of Gremlins and Waxwork! So, my day was pretty much made from the get go. When the show actually started, I had steady traffic coming by my table all day. I saw some people I haven't seen since last year (author Jess Rougeau and my pals from Metal Dogz), and had some great neighbors (Lisa of Happy Kitty Studio and Sam Costello of Split Lip). One very cool and somewhat surreal experience was seeing people who have bought books from me in the past come by to pick up the latest ones. Whenever someone tells me they are a fan of my writing, I am blown away. Every time. I can't tell you how much it means to me to hear someone enjoyed something I wrote. So, thanks to everyone who stopped by the table to say hi. Oh--I sold books, too! 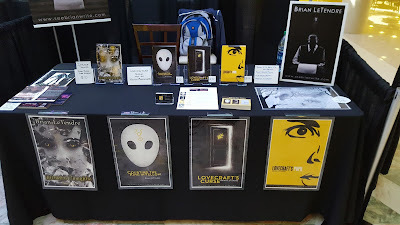 I covered my table cost and then some, and it was a successful debut for my short story collection, Intrusive Thoughts. My best show sales-wise for sure. The capper on an amazing day was getting to meet one of the greatest horror creators of all time--George Romero. I have to give a huge shout out to Chris Conway from Horror News Network, as he encouraged me to go over and say hi to Mr. Romero, and he watched my table when I did. Getting to tell him how much his work means to me was a great moment, and he was extremely nice. So, another wonderful CT HorrorFest is in the books, and I can't wait to go back again next year. Thanks again to the HNN crew for all of their hard work--it paid off big time. 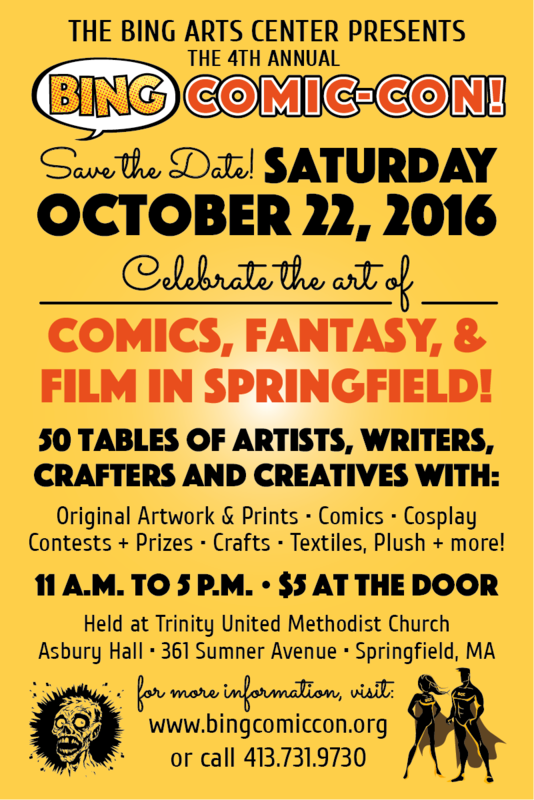 Come See Me at CT HorrorFest This Weekend! One of my favorite shows of the year is this weekend! 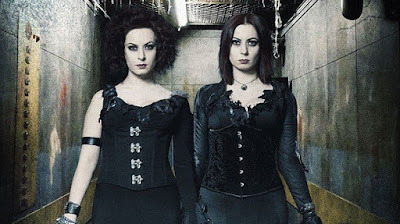 Connecticut HorrorFest, put on by my pals at the Horror News Network, will be happening this Saturday at the Matrix Conference Center in Danbury, CT. The lineup of guests is amazing, and includes George Romero (Night of the Living Dead), Ellen Sandweiss, Betsy Baker and Theresa Tilly (Evil Dead), Tyler Mane (Halloween), Zach Galligan (Gremlins) and a ton more. But I will also have my band new collection of short stories Intrusive Thoughts, which is not even available online yet! 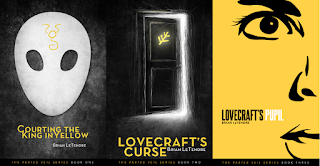 This collection features two stories that are connected to the Parted Veil series, including the origin of one of the characters. It also features the origin story of a major character in Orchard Pointe, the new book Jolene Haley and I will be releasing soon. 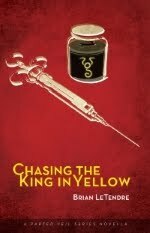 All of the stories are standalone however, and there's a little something for horror fans of all types in this one. So, if you're in the CT/NY area, come out to Danbury for Connecticut HorrorFest this Saturday. And if you do, make sure to come by my table and say hi! This year's TerrifiCon at Mohegan Sun in Uncasville, CT was amazing. 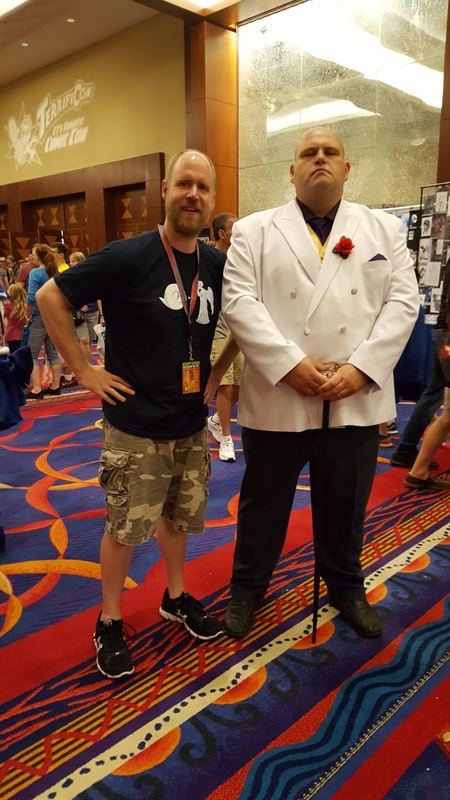 Matt Herring and I were exhibiting at the show for Secret Identity, doing interviews for the podcast and hosting and moderating panels all weekend. My son and I got to see John Wesley Shipp (The Flash) again and meet Katrina Law (Arrow) for the first time. Both were super nice and were great to my son, which makes me even bigger fans of theirs. Matt and I hosted two panels on starting your own podcast. 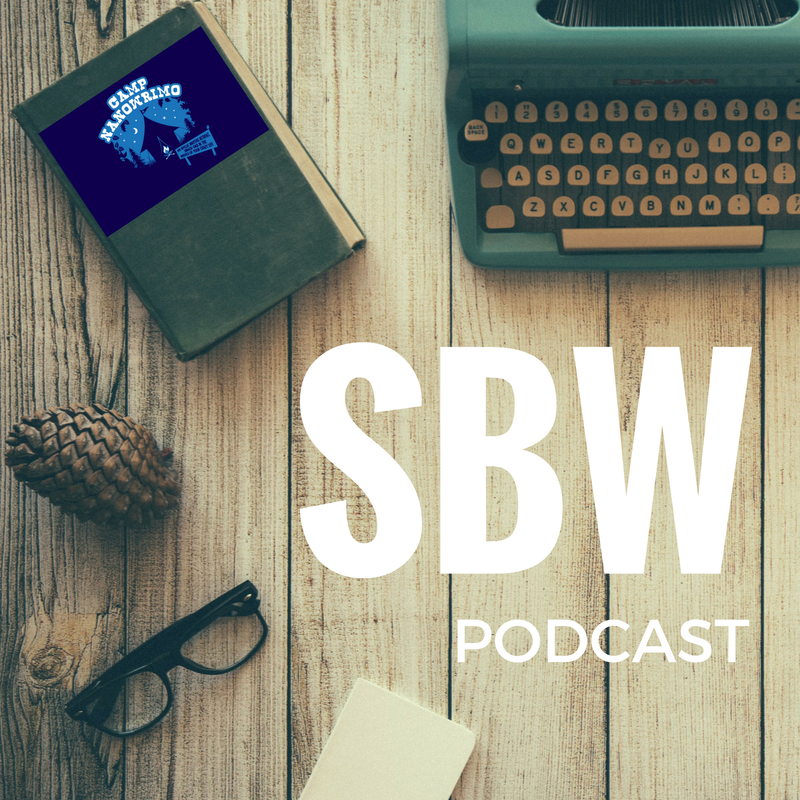 I love talking about podcasting and especially love to talk with people who are just starting their own show. We met a ton of great people who had questions, feedback and some really great ideas for shows. I can't wait to check out their podcasts when they launch. On Sunday, I got to moderate my dream panel. Anyone who l knows me knows that I am a lifelong Spider-Man fan (my son's name is Parker). I was lucky enough to moderate a panel called The Amazing Spider-Man: 35 Years of Writing Spider-Man. A veritable Mount Rushmore of Spidey writers were on the panel--Dan Slott, J.M. DeMatteis, Roger Stern and Peter David. These four guys are responsible for some of the greatest storylines and moments in Spider-Man's history--Kraven's Last Hunt, The Death of Jean DeWolff, The Origin of the Hobgoblin, Spider Island and so many more. I was so enthralled with listening to them that I forgot to start recording the panel until about ten minutes in. I'm actually hoping to get a full recording of it (audio of video) so I can share it with everyone, because it was a blast. 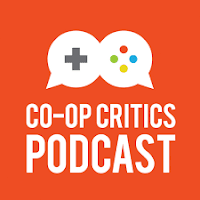 On top of all that, I got to catch up with some of my comics friends that I rarely get to see, and we got some great interviews for the podcast. All in all, TerrifiCon was a fantastic show, and i want to thank the man behind that show, our pal Mitch Hallock, who continues to grow TerrifiCon into one of the best shows in the country. I can't wait until next year! 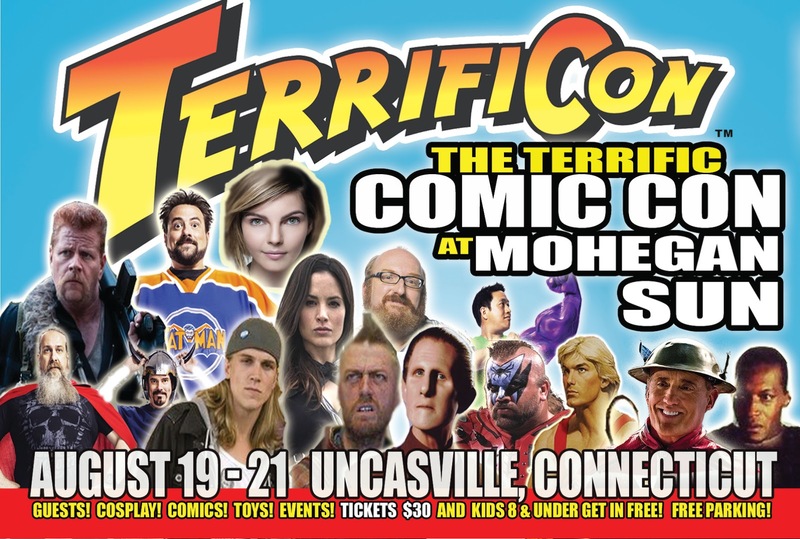 This weekend I'll be at the Mohegan Sun Casino in Uncasville, CT for TerrifiCon! 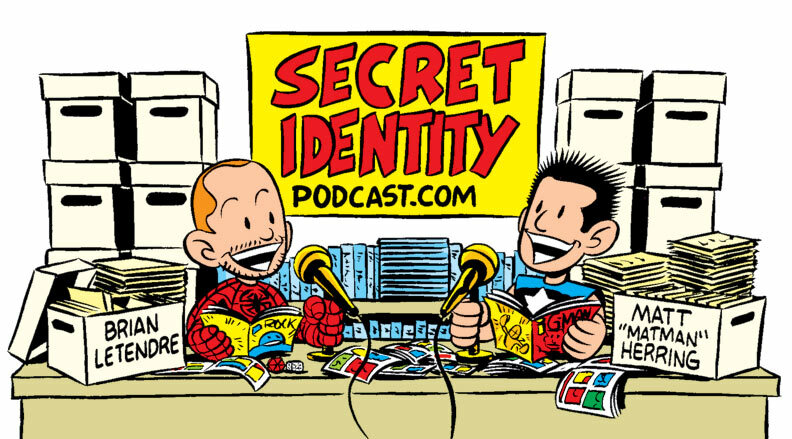 Not only will I be doing interviews for the Secret Identity podcast, but I'll be hosting panels as well. 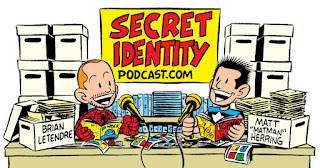 On Friday and Sunday, my Secret Identity co-host Matt Herring and I will be doing two podcasting panels. 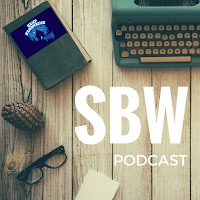 These panels are aimed at anyone interested in starting their own podcast or looking to hear about our experience hosting and producing podcasts for the past ten-plus years. I will also have print copies of my podcasting book MAKING EAR CANDY at the show. 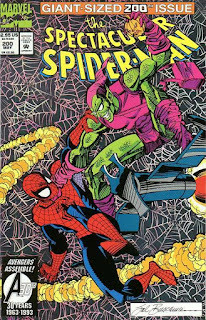 On Saturday 8/20 from 2:00 p.m. to 2:45 p.m. (PANEL ROOM 1 (Nehantic/Pequot/Paugusett)), I will be moderating my dream panel--Amazing Spider-Men: 35 Years of Writing Spider-Man. This panel will feature legendary writers Roger Stern, Peter David, J.M. 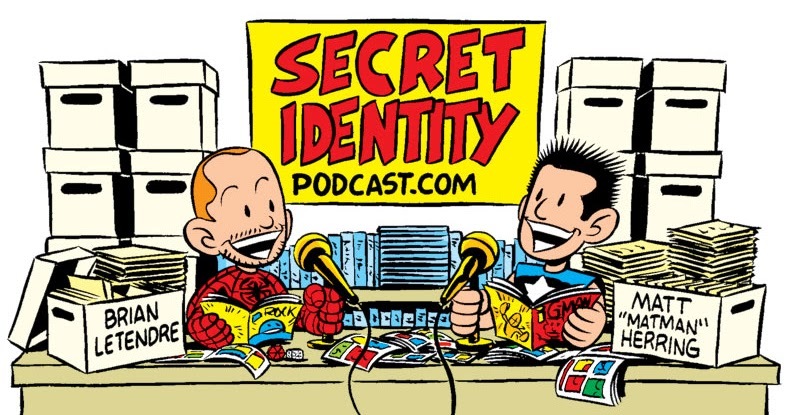 DeMatteis and Dan Slott, and we'll be talking about some of the amazing moments they've created during their runs on Marvel's flagship character. As a lifelong Spidey fan, I cannot tell you how excited I am for this one. So come on down to TerrifCon this weekend and hang out! 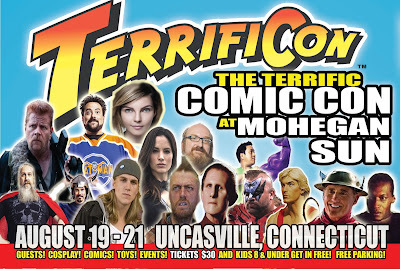 You can find out more at www.terrificon.com! Where has the summer gone?!! Seriously, I feel like it was the end of May like two weeks ago. But here we are. in mid-August, and I've got two book projects coming out this month. One of the reasons for my lack of updates lately is that Jolene Haley and I have been laser focused on final edits for Orchard Pointe, which should be arriving on August 16th. An interesting aspect of Orchard Pointe (I think), is that it has some French-speaking characters in it, which has added a layer of complexity to both the writing and editing processes. Jolene and I want to give a big shout out to Magali Fréchette, who has been a tremendous help to us in making sure our French dialogue was accurate. And then of course there is my short story collection Intrusive Thoughts: Volume One, which will be out digitally before the end of the month. I actually debuted some print copies of the book at the Plastic City Comic Con in Leominster in late July, and the feedback has been very positive so far. I'll be taking the rest of those print copies with me to the Connecticut HorrorFest on August 27th. 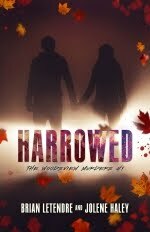 In addition to those pending releases, Jolene and I are hard at work on the sequel to Harrowed, which is called Haunted. We're around 65K in our draft now, so we have a ways to go, but it's coming along very nicely. We think you'll really like some of the new characters we're introducing, though I can't promise they'll all be sticking around for the duration (*insert evil laugh here*). So, the summer has flown by, but there's a lot of exciting stuff coming up. 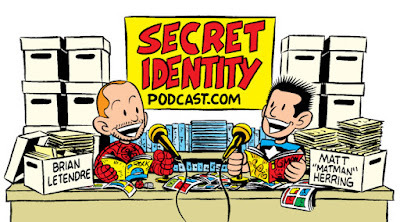 In addition to my writing projects, I'm still putting out new episodes of the Secret Identity podcast every week with my pal Matt Herring. 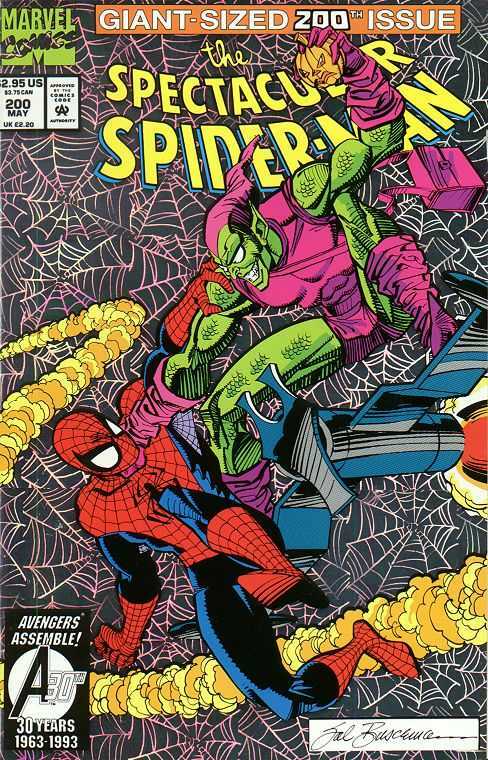 We'll be heading to TerrifiCon later this month, where I'll be moderating a Spider-Man panel featuring Dan Slott, J.M. DeMatteis, Peter David and Roger Stern, which is basically a Mount Rushmore of Spider-Man writers for me. 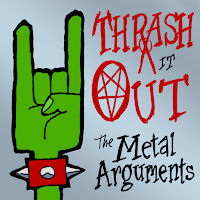 If you're a music fan, Antony Johnston and I just released the latest episode of our music podcast Thrash It Out, in which we discuss Type O Negative's album October Rust. And finally, if you're into gaming, Nick Merritt and I just posted the most recent episode of the Co-Op Critics Podcast, where we discuss Blizzard's newest game Overwatch. So as you can see, I've been keeping busy this summer. Now it's time to get back to work on Orchard Pointe, because Jolene and i cannot wait to share it with you. Editpalooza 2016: Orchard Pointe is Almost There! Over the past month and a half, Jolene and I have been doing edits and rewrites on Orchard Pointe, and I'm happy to say we're almost there! 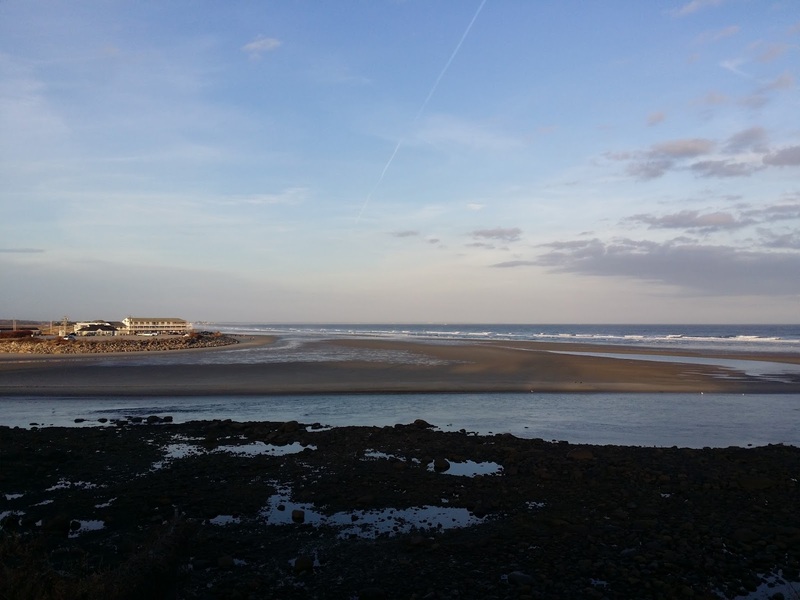 This past week marked a major milestone, as we finished a significant rewrite of a supporting character's storyline that affected the last third of the book. I've mentioned before that edits and rewrites remind me of Jenga, where pulling one piece out can bring the entire structure crashing down. I think about that concept quite a bit when reading other people's work, watching movies, or even playing video games. In every creative project, there are things that are less than perfect, And through the revision and polishing process, choices always have to be made. If I change this, what else does it affect? Does it break anything? How much of the story will need to be rewritten to accommodate this change? How does this affect the book's deadline? Is it worth delaying the book for? There are plenty of other questions as well, but those are some of the biggies. I'm sure all creators have similar lists of questions. Anyway, the reason I blathered on about that is to provide context for the rewrite Jolene and I just completed. 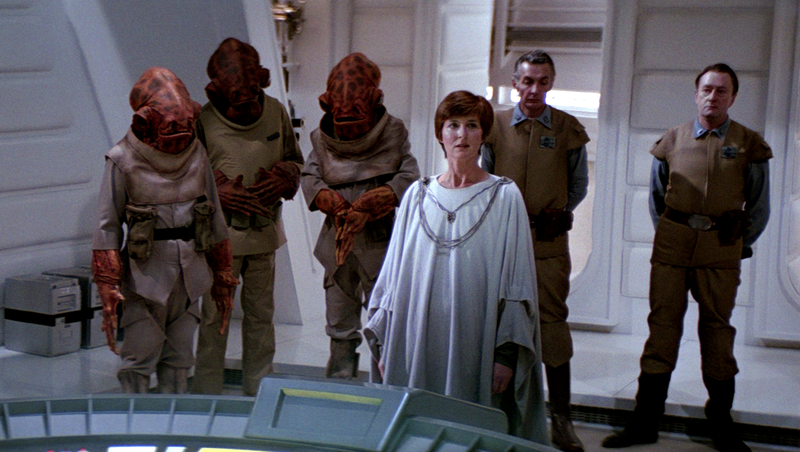 A couple weeks ago, we were discussing the arc of a supporting character. 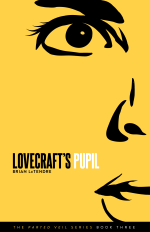 And it became clear through our discussion that the character in question kind of faded in the last third of the book. Jolene had some great ideas about ways we could make it better, and we talked about the aforementioned questions of what it would take to do that. 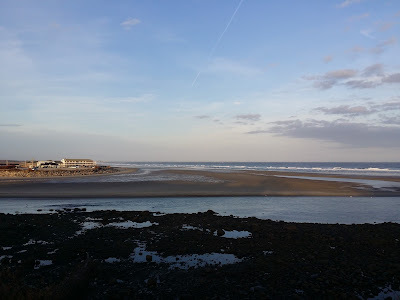 In the end, we decided that not only would the story be better for the changes, but the changes were worth it, and if we stayed on track, they could be made in our current revision schedule. So, we did it. 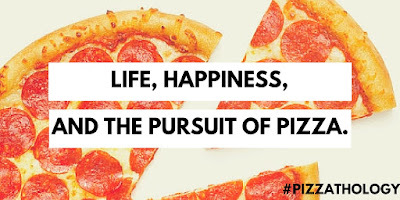 And looking back now, it was absolutely the right choice. The story is stronger for it, and the book feels more complete. We have also left the character in a place that we can explore in future stories, which is always a good thing. With that rewrite out of the way, we are now in the final stages of edits for Orchard Pointe. 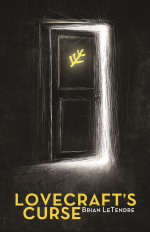 We'll be talking a lot more about it as we get closer to release, and keep your eyes peeled for a cover reveal soon! 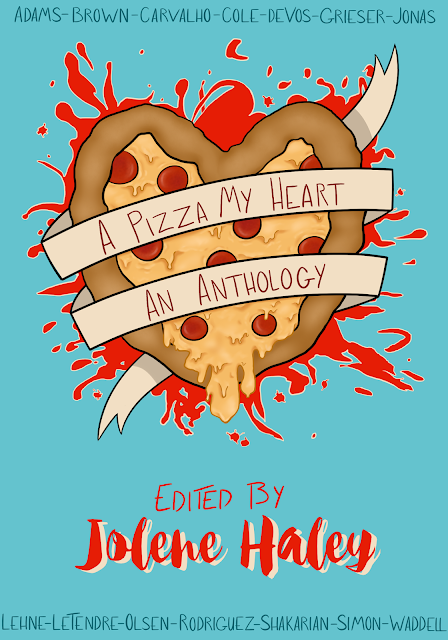 Last month, I told you about a new pizza-themed fiction anthology I was going to be a part of--A Pizza My Heart. 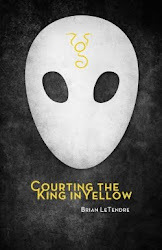 Well today, I am happy to share with you the amazing cover that Haley Crosby designed for this project. I think you'll agree, it's mouth wateringly good. If you missed my last post, here's the info on this fantastic project, which was put together by my amazing writing partner, Jolene Haley. 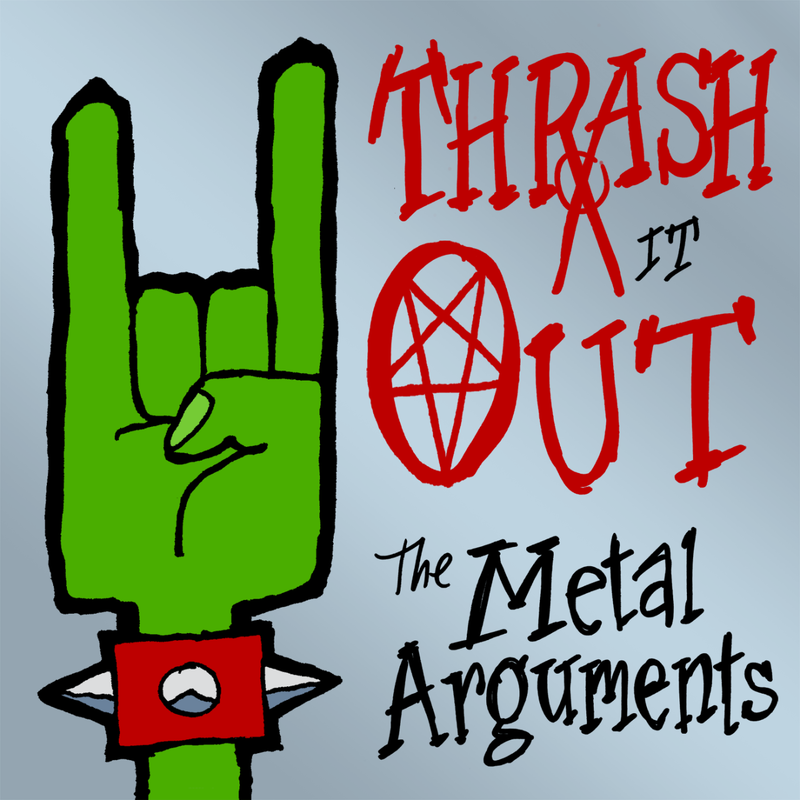 My love of '80s rock and metal is well documented, from the Thrash it Out podcast I do with Antony Johnston, to the Liner Notes segments that have been featured on Secret Identity for years. I went to high school from '88 to '92, so I grew up in the MTV era and was a teenager during the height of the hair metal movement. The past ten years have seen a real resurgence of the bands I grew up listening to, and many of them are putting out music today that stands alongside the best stuff they've ever done. A lot of them are also touring again, and are just as great live as they were back in the day. 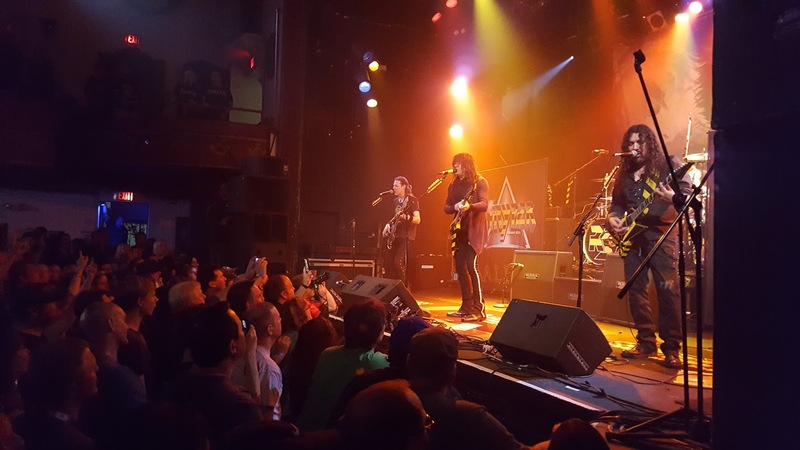 Stryper is an interesting band because many people dismissed them for their Christian themes and lyrics. As a kid who went to Catholic school through sixth grade, Stryper was the one metal band that my parents actually didn't mind me listening to. And listen to them I did. Stryper was among my favorite bands, and still is to this day. Sadly though, I didn't get to see them live when I was a kid, because I was always too young to get into the venues they played at. The first time I actually saw them in concert was in 2009, and they were amazing. 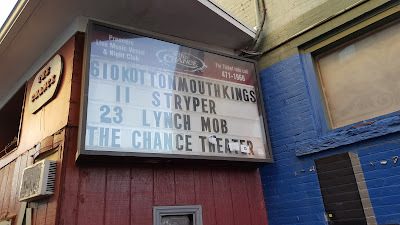 So it was with great anticipation that I drove down to Poughkeepsie, New York this past Saturday with my pal Matt and my nine-year old son to see Stryper play at The Chance Theater, a venue that has hosted everyone from the Police to Twisted Sister to David Bowie. Matt is the host of the Stryper podcast, and he interviewed both lead singer Michael Sweet and Guitarist Oz fox before the show. 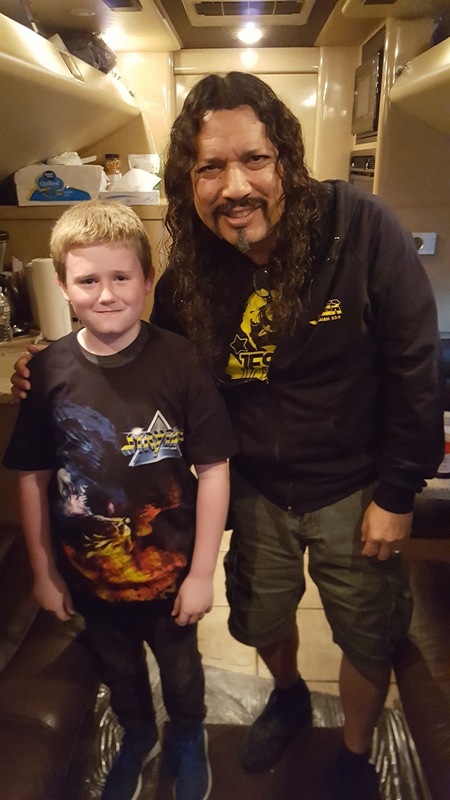 We got to tag along, which meant my son got to not only meet the guys, but to hang out on the tour bus for a bit. It will probably take him a few years to realize how amazing that moment actually was, but he was psyched to meet the band and hang out for a bit before the show. 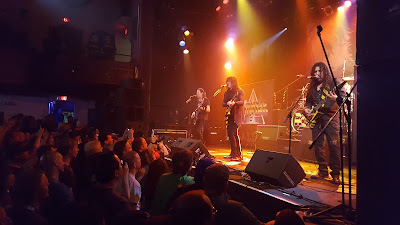 After a few opening bands, Stryper took the stage and ripped through 22 songs that featured a great mix of old and new, as well as a few covers. I am a huge fan of The Yellow and Black Attack album, and they played three cuts from that one--"You Know What to Do," "Loud 'n' Clear" and "C'mon Rock." Of course they also played hits like "Soldiers Under Command," In God We Trust" and "To Hell With the Devil," a song for which they invited 15-year old Mariah Formica up on stage to sing lead vocals for. She was amazing. You can watch the video of that performance right here. All in all, the show was great, the night was great, and the memory of sharing it with my son is one I will cherish forever. 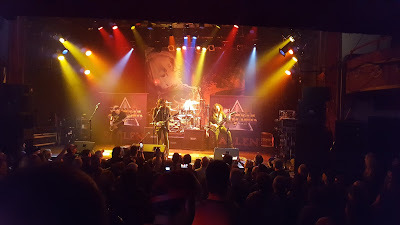 If you get a chance to see Stryper live, take it.